Hold the gauge with the left hand and place the cable between the two nylon spools as shown in Figure 1. With the right hand pull the lanyard and extend the spring until the hook on the nylon slider can be hooked on the cable as shown in Figure 2. Release the lanyard. Read the needle position on the scale. Refer to the calibration table obtain correct tension in the cable. The gauge can be left on the wire for "hands free" adjusting of the cable. To assure accurate readings make sure that the slider moves freely in the frame slot and does not bind. Also, lubricate the slider slot frequently with silicone lubricant. An extra 1/4" inch hole is provided in the frame of the instrument for an attachment of a short lanyard and snap hook (not furnished) for securing the gauge to the cable. This will prevent loss of the instrument if it becomes inadvertently detached. Table 1 recommends an initial tension setting, but there is no simple solution since the optimum rigging tension will be a function of the boat design, the rig (masthead or fractional, one or more spreaders, etc. ), and even the cut of the sails. 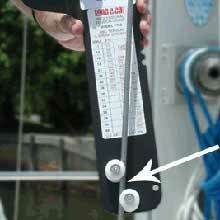 Many skippers use insufficient tension because of a fear of "breaking something." It should be noted that on America's Cup contenders, where electronic state of the art tension instrumentation is available, the standing rigging is set as tight as is structurally feasible. 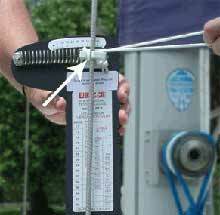 Most sail makers who produce sails for the one design classes provide each purchaser with specific set of readings on the Loos Model A or Model B tension gauges for use when setting up the standing rigging. This assures that the sails will have the correct shape when the rig is under load. For the convenience of sailors who wish to upgrade from our Model A or B gauges to the professional model (PT-1, PT-2, or PT-3) gauges we include below a conversion chart so that the same recommended tension can be obtained with the PT-1, PT-2 or PT-3 gauges as with the Model A or B gauges. When no specific requirements are provided by the sailmaker, the following general comments will provide a basis for a rational procedure for tuning the rig. Forestay Tension - Masthead Rig On the masthead rig it's almost always advantageous to set the forestay tension as high as possible within the limits of structural strength. Generally, it's possible to use 15% of the breaking strength of the cable. Thus, a forestay tension of 1,000 lbs. is a reasonable place to start with a 7/32"diam., 302 / 304 1X19 stainless steel cable. Backstay tension would, of course, have to be adjusted to maintain a straight mast with the desired forestay tension. Since the backstay makes a greater angle to the mast, the backstay tension will be lower than the forestay tension. NOTE ! ROLLER FURLING CAN ONLY BE SET BY BACK STAY TENSION. Forestay Tension - Fractional Rig In a fractional rig the forestay does not go all the way to the masthead and forestay tension cannot be directly balanced by tension in the backstay. Therefore, some mast bend is generally accepted and the mainsail is cut to fit the bend. A forestay tension of at least 15% of the cable strength is desirable. However, if this results in excessive mast bend it will be necessary to back off a bit. On some fractional rigs, diamond shrouds are used to reduce mast bend. Upper and Lower Shroud Tension - Masthead Rig There is a simple criterion for shroud tension. The initial rigging tension should be high enough that the leeward shrouds do not go slack when sailing close-hauled in a reasonably brisk breeze. The proper value for your boat can be found by a few trial runs under sail. Once the correct tension is known, the gauge can be used to maintain the value. For many boat designs a shroud tension of 10% to 12% of the breaking strength of the cable is adequate. Thus, for 7/32", 302 / 304 1X19 stainless steel cable , the upper and lower shrouds would be set to 600 to 700 lbs. tension. On some rigs it may be desirable to carry more tension in the uppers than in the lowers. NOTE ! THE INTENDED USE OF THIS GAUGE IS TO BE USED ON 302 / 304 1X19 S.S. CABLE IN APPROPRIATE SIZES. IF USED ON OTHER CABLE TYPES, SIZES, AND CONSTRUCTION YOUR READINGS WOULD BE CONSISTENT (REPEATABLE) BUT POUND TENSION VALUES WOULD DIFFER FROM THOSE LISTED ON THE LABEL. GAUGE MAY NOT READ "O" WHEN AT REST, AS THEY ARE CALIBRATED AT MIDRANGE OF TENSION. NOTE ! IF FLAT SPOTS APPEAR ON NYLON SPOOLS AFTER EXTENDED USE, ROTATE NYLON SPOOLS 45�. Cable size 3/32", 1/8", 5/32"
Cable size 3/16", 7/32", 1/4"
Cable size 1/4", 9/32", 5/16", 3/8"